We know how to use multiple monitors on single computer to increase the productivity but in certain cases, we need to use single monitor on multiple computers. For example, if you want to have a test computer system to run all your test installations and to use other computer as non-test, always running and reliable system then you can read this post to see how to manage both computers using the same monitor, keyboard and mouse. Managing (physically but not on LAN) multiple computers thru different input devices and monitors is a difficult task as you will have to move to other desk or location all the time to manage other system. But there are things to connect your computer in such a way that you can use single (common b/w both systems) monitor, keyboard and mouse on multiple CPU to manage all of them from one desk by switching the CPUs by a keyboard shortcut. I think this idea of using a common monitor and input devices for multiple CPUs is really useful for tech bloggers like me who use to test lot many software and operating systems before posting a helpful article. Note: You can use network desktop sharing tools to access other computers connected to your LAN or you can also access other computers on Internet but that will not provide you the same experience as accessing a computer directly. Specially for testing different software or operating systems (without using Virtual Operating System). KVM Switches are a connecting hardware used in computers to have a common input device and output device. For example, Belkin 2-Port PS/2 KVM Switch will let you connect single monitor, keyboard and mouse with 2 CPUs. Once connected, you just need to press a button to switch between CPUs or you can use keyboard shortcut (hot-key sequence as set by you) to do the same. There are lot many KVM Switches brands available and you can choose as per your requirement. For example, Belkin 2-Port PS/2 KVM Switch is available for Rs. 1,350 on Ebay India or you can purchase the TRENDnet 2-Port USB KVM Switch on Amazon at $18.00 only. 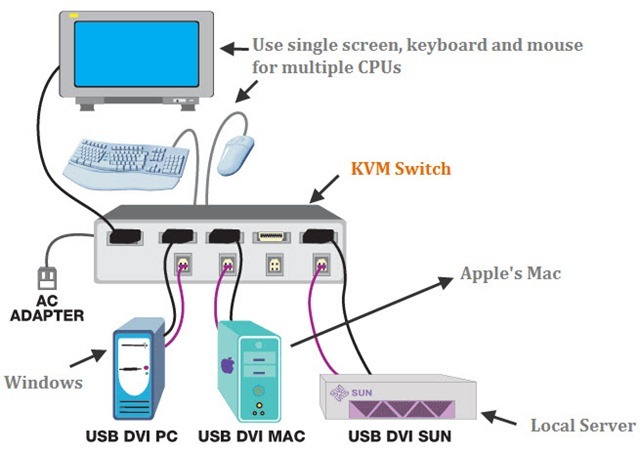 By using these KVM switches, you can actually save cost of extra monitor, keyboard and mouse. If you are planning to use both computers for yourself only, then I would recommend to use KVM switches rather than using two separate desks for managing 2 or more computers. For small offices, you can manage your administrative server by using KVM switches as well. This will help you monitoring your server without even moving away from your own desk location. Did you like the idea of using KVM switches rather than purchasing multiple monitors for your test and production system?